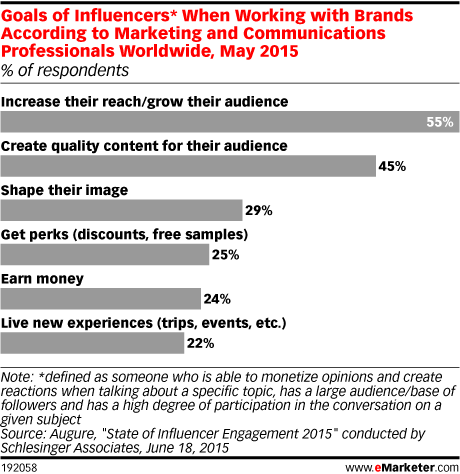 Data is from the June 2015 Augure report titled "State of Influencer Engagement 2015" conducted by Schlesinger Associates. 603 communications and marketing professionals worldwide were surveyed online during April 30-May 28, 2015. Respondents were from Europe (56%), Latin America (9%), North America (34%) and other (1%). Respondents identified their specialty areas as marketing (48%), PR (41%) and other (11%). Respondents identified their position as middle management and staff (57%) and C-level (CEO, CFO, CTO) and senior management (43%). Respondents identified the size of their company as 1,001+ employees (41%), between 51-1,000 employees (32%) and fewer than 50 employees (27%). Augure provides software to PR and communication professionals. Schlesinger Associates is a market research company.